Neil has a plethora of experience in different performing situations. During the '80s he had a single in the UK charts, subsequently he has performed in the West End and other touring shows as the Big Boppa and Elvis as well as in supporting roles. 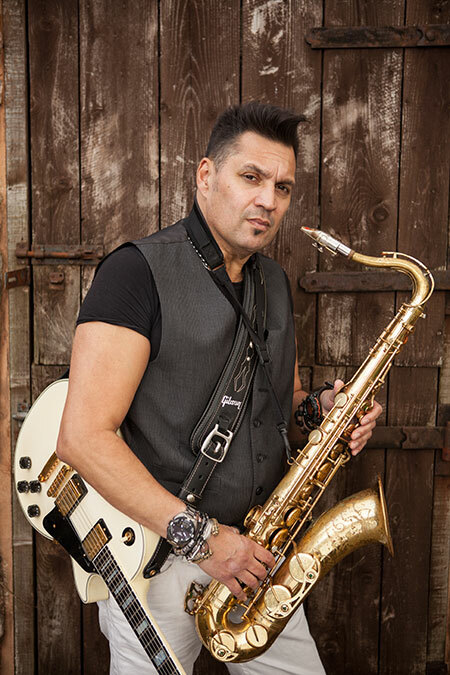 He has a stunning tenor voice and is an extremely accomplished tenor saxophone player. He has performed with Milo Max since 2010 and has worked with fellow Milo Max member Steve for over a decade before that. See Neil & Steve perform together in a reunion live on BBC TV in their previous band 'Buddy Holly & The Cricketers'. Neil, originally from Salisbury, Wiltshire, started out studying singing at Winchester College of Music, developing his astonishing 3½ octave range. In those early days he also started studying saxophone, flute, trumpet and keyboards. He has taken his vocals and saxophone to very high professional standards. As a very young man in 1985, Neil was signed to Elecstar Records on a two-single deal and, similarly, in 1986 to Pyramid Records (EMI). The latter received TV coverage and radio play in Great Britain. Neil was voted Best Voice in 1988 in Cosmopolitan Magazine and in the same year was the subject of music articles published in Company, Miz and 19. From here, he worked with Peter Balotti, best known for writing and producing hits with Donna Summer. He has sung on many albums, including Mick Fleetwood and Pete Bardens, and also the Remix Factory (Madonna, Britney Spears). Neil is a sought after session singer, first working for Zomba Records and Chappel Publishing and more recently, Air Force productions and Vibe Music. During this time he has appeared on Radio 1, Capital, Virgin, Heart FM, X FM and other BBC Radio stations - earning a place amongst the most frequently asked questions on the Chris Moyles web site! As an actor/musician Neil has entertained West End audiences including in two lead roles: Cookie in Return to the Forbidden Planet and The Big Bopper in The Buddy Holly Story. He also took the Big Bopper to Europe with the touring production of Buddy. He has toured the USA and British Isles with the cult Buddy Holly and the Cricketers touring company, Neil added Elvis to the already popular Big Bopper. More recently Neil has co-written the music for a new musical, "I'm Telling You They're Aliens". This was given the blessing from, Jeremy Strong, the author of the Popular book of the same name and on the back of this Neil has been commissioned to co-write the music for a new pantomime, which like "Aliens", will be touring large theatres across the United Kingdom. Having been a professional session singer for many years Neil has now started writing, playing, singing andproducing Jingles and Production music himself and has three Idents being played on "Suzy Radio" (Sussex and Surrey) at the moment (as of 2014). Other acting experience includes a number of TV adverts, such as Metz (Judder), Vicks and QVC on Sky TV and Neil performed on BBC show ‘The One and Only’ hosted by Graham Norton with fellow Milo Max member Steve.